From the welcoming entrance hallway which boats a cupboard and WC cloakroom, most of the ground floor is entered. The elegant lounge features bay window frontage, living flame gas fire and double Georgian styled doors to the dining room which is filled with natural light. The dining kitchen overlooks the south facing garden with patio doors leading out. Fitted with an range of base and wall units together with integrated appliances including microwave, oven, gas hob, fridge and dishwasher. The adjoining utility room includes the washing machine, tumble dryer and freezer with two large cupboards and leads into the double garage. Completing the ground floor is the fifth double bedroom. Upstairs, the large master bedroom benefits from twin double built-in wardrobes, bay window frontage and a luxurious en-suite shower room. A further three double bedrooms each benefiting from built-in wardrobes and are served by the sizeable family bathroom comprising vanity unit storage and shelving, separate bath and shower. Outside, the front garden is laid with grass and flower beds while the rear is fully enclosed to provide a safe environment for children and pets. Extensively laid to lawn with the south facing aspect providing all day sun. A large driveway leads to the double garage with twin up and over doors, power and light. 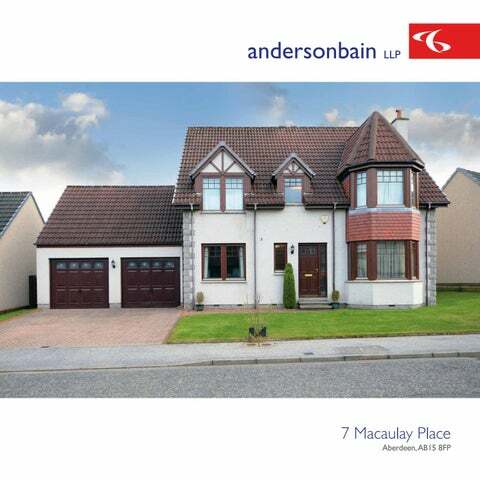 Macaulay Place is situated in the popular Craigiebuckler area of Aberdeen and is within walking distance of a range of shops at Countesswells where there is an excellent supermarket, Post Office and further retail units. There are good public transport facilities providing regular access to the city centre. Airyhall Primary School is the catchment school for primary age.